As any other data structure, we need at least the two basic operations: insert data and remove data. PQs also warrant an update priority operation. Here’s how we’ll implement those. 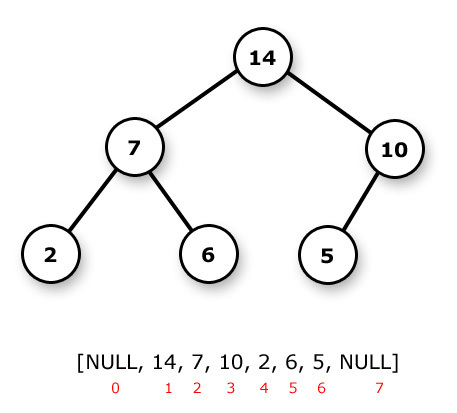 Because we won’t be using array index 0 (since both children would also be 0), we need to remember two things: increasing by 1 the request maximum heap size (and allocating accordingly) and always filling aray with something we know (preferably NULL) so we don’t get bogus memory reads if we do something wrong. *  condition, until it reaches the appropriate depth. Pop removes array (heap’s node with highest priority), replaces it with array[heapsize] and calls heapify at the heap root. Push “floats up” the new value to be inserted starting at the bottom of the heap until it reaches the appropriate level. Update (aka “decrease-key” or “increase-key”) changes the priority of a node and re-evaluates the heap so that it maintains heap property.